Usually at this time of winter Hellebores and Daphne have begun offering up their flowers, but there are no flowers outdoors this week. 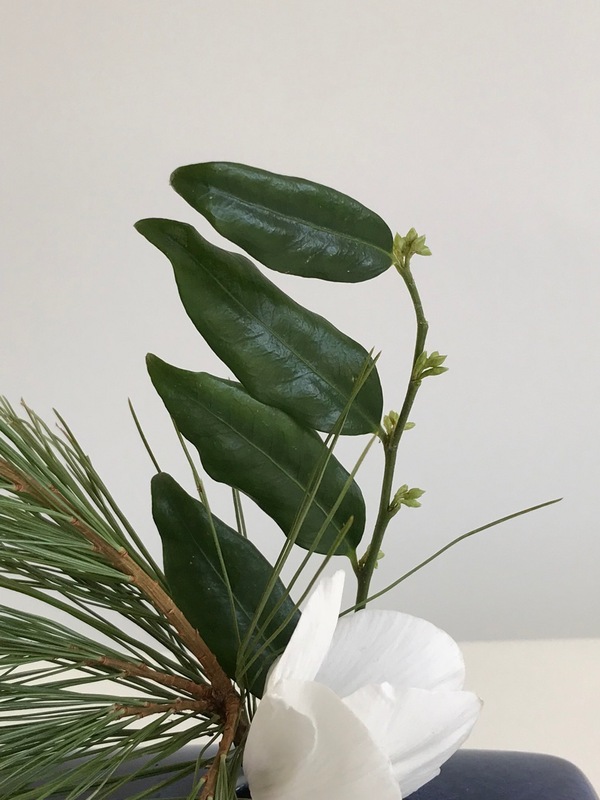 A single white cyclamen from an indoor plant stands in to represent the winter garden flora. There was more choice for foliage. 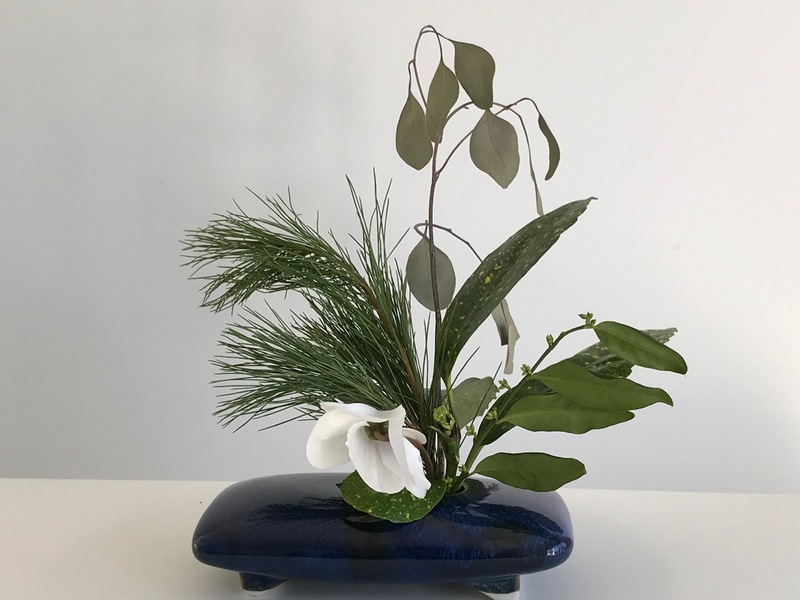 I settled on broad, patterned leaves of aucuba, a stem tip cut from sarcococca (with flower buds), a dried piece of eucalyptus and a pine branch scavenged from a holiday evergreen gift from treasured friends. 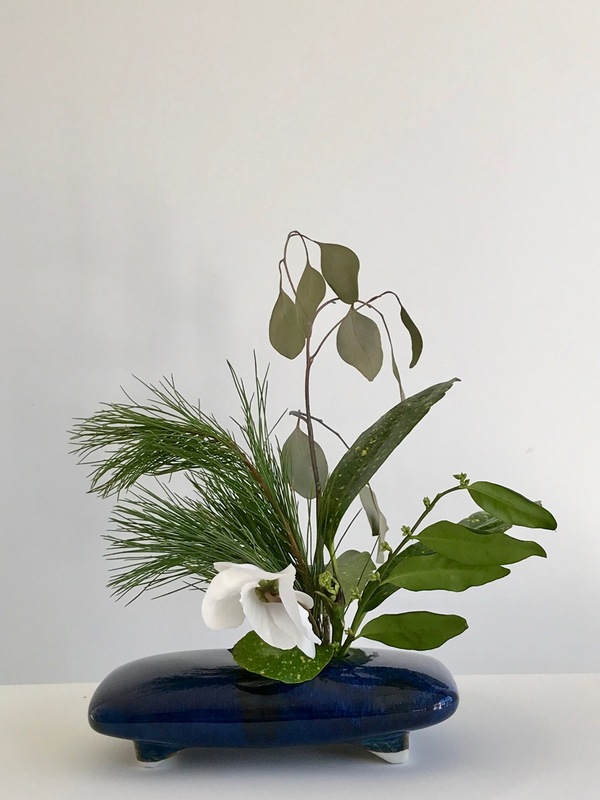 The pine seemed to call for an Ikebana vase and I chose a blue rectangular one that I have used many times before. The design transitioned multiple times and is still in a state of flux. This one has many paths and I am still searching. 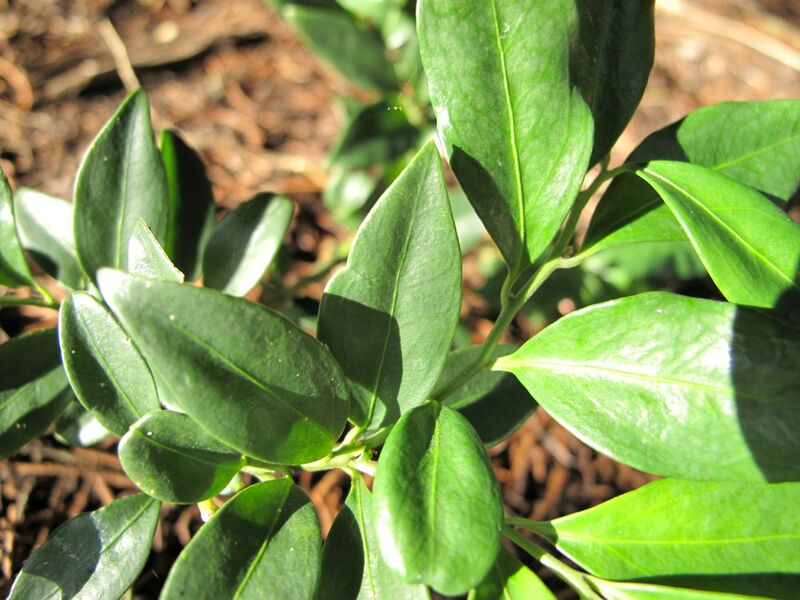 This is is current state, simplified, and featuring sarcococca. 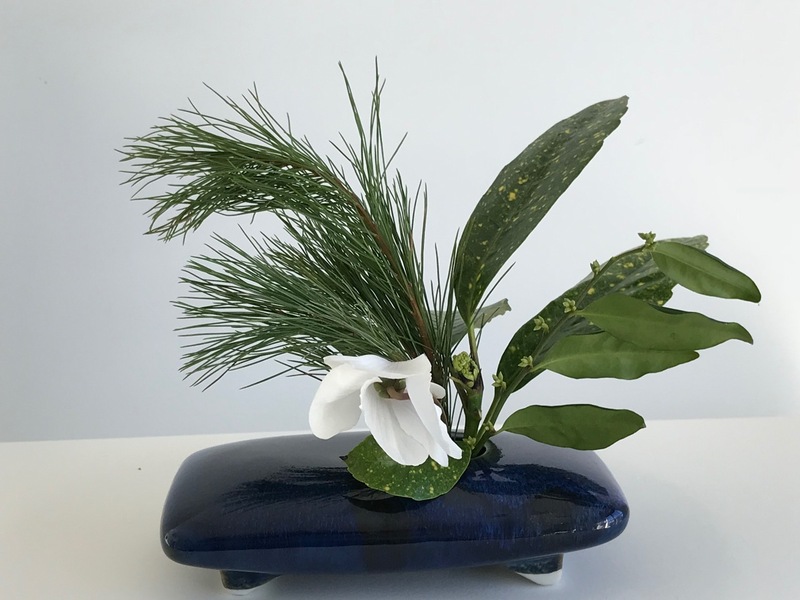 This entry was posted in garden and tagged 2018vase, cyclamen, flower arranging, flower design, in a vase on monday, nature photography, sarcococca rustifolia on January 15, 2018 by pbmgarden. Time again for Garden Bloggers Foliage Day (GBFD), hosted by Christina at Garden of the Hesperides. This very hot, dry May has been a tough month for the garden. A sprinkling of rain on Thursday brought scarcely enough drops to acknowledge. Temperatures at least are cooler and the weekend is forecast to be sunny and beautiful. Trying to make a positive comment as she walked along the borders the other day, one honest neighbor suggested, “I bet this was really beautiful last week.” Indeed the garden is moving past is best for this year, but there are a few places where May foliage stands out. 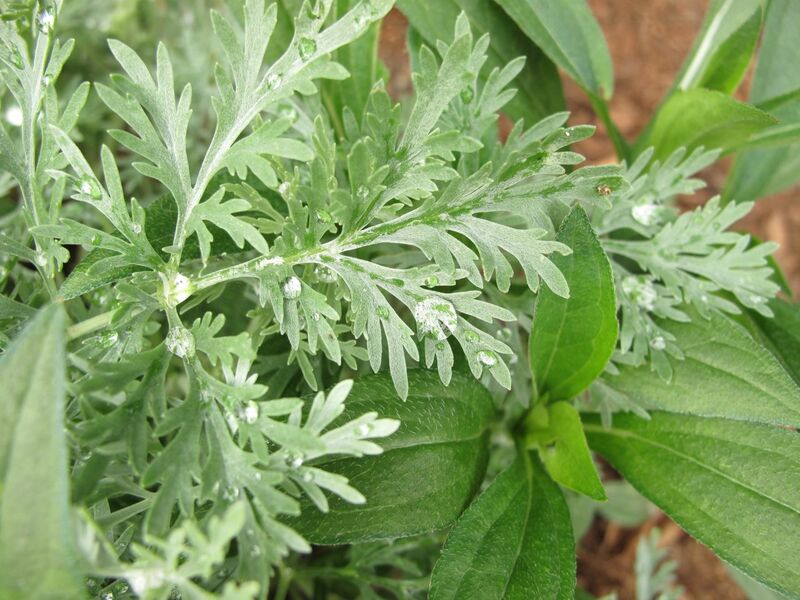 Any water droplets on the leaves are probably from nearly daily hand waterings. I like the loose feathery texture of Liatris spicata ‘Floristan Weiss’ (Gayfeather). 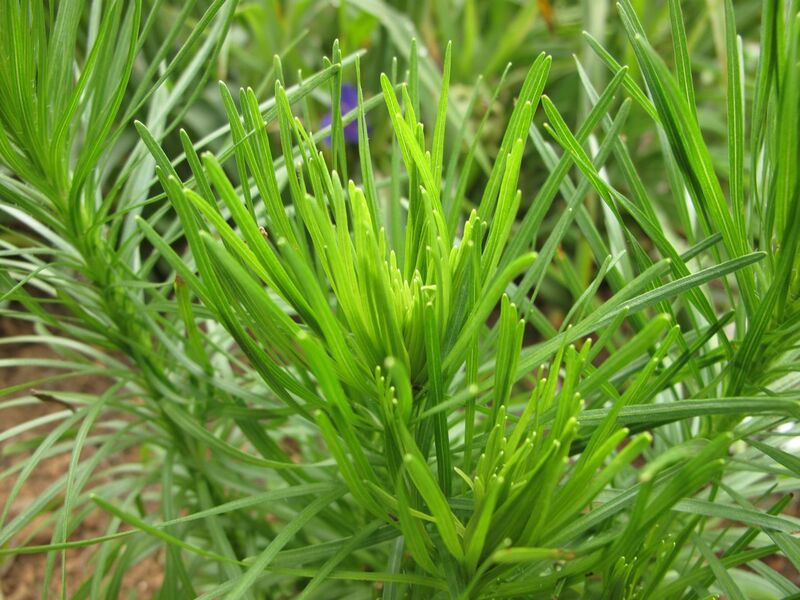 Two of these planted in the northwest corner this year they are beginning form flower spikes. There is a mostly sunny garden, but I protect a few shade-loving plants by situating them under a large juniper in the southwest corner. 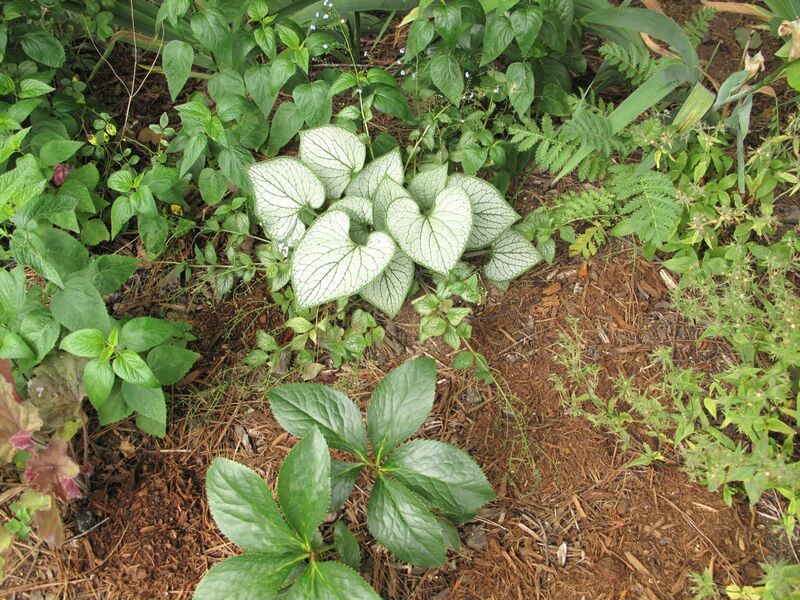 Heuchera, Hellebore, Brunnera, Phlox divaricata. 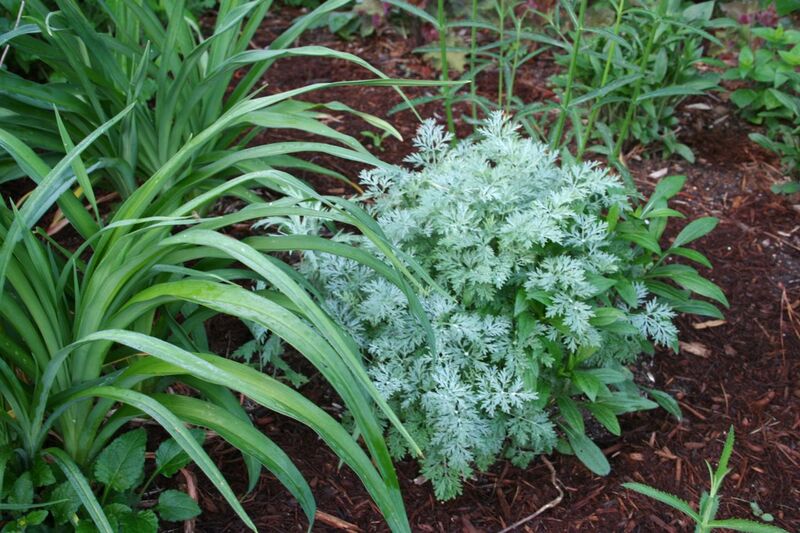 Tansy, with its ferny foliage, prefers full sun, but underground rhizomes keep it spreading into this area anyway. 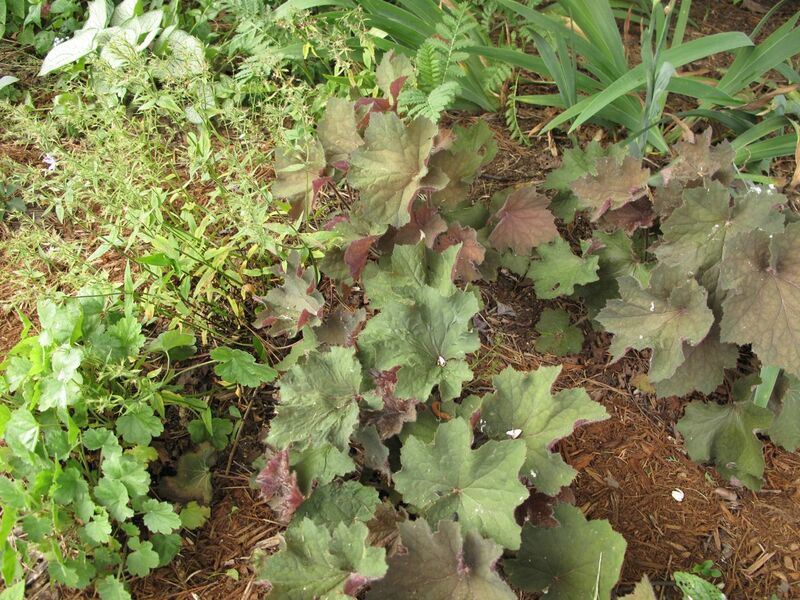 Similarly, it seems Salvia guaranitica ‘Black and Blue,’ which can take sun or part shade, is spreading in close around the silver-leaved Brunnera. 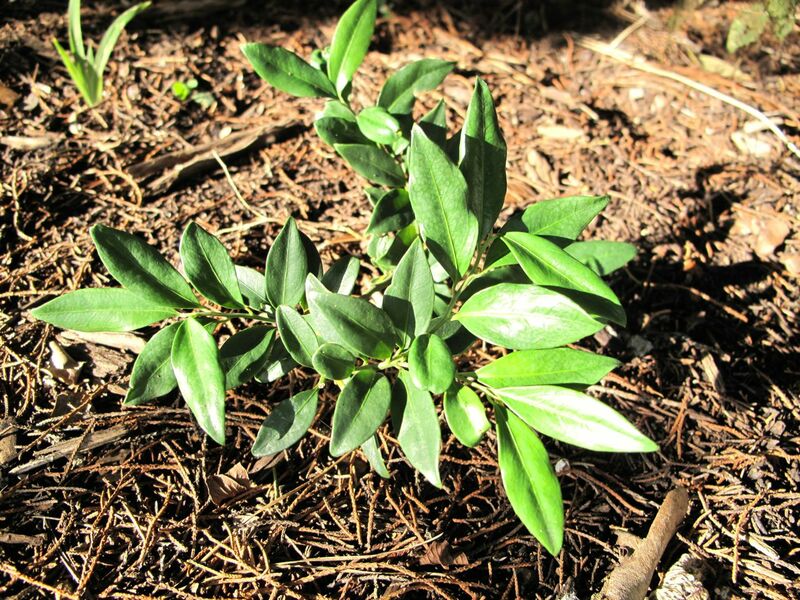 Also in this area is a pass-along Sarcococca ruscifolia (Fragrant Sweet Box), which after several years now is still very tiny. I look forward to its fragrance when it decides the time has come to bloom. 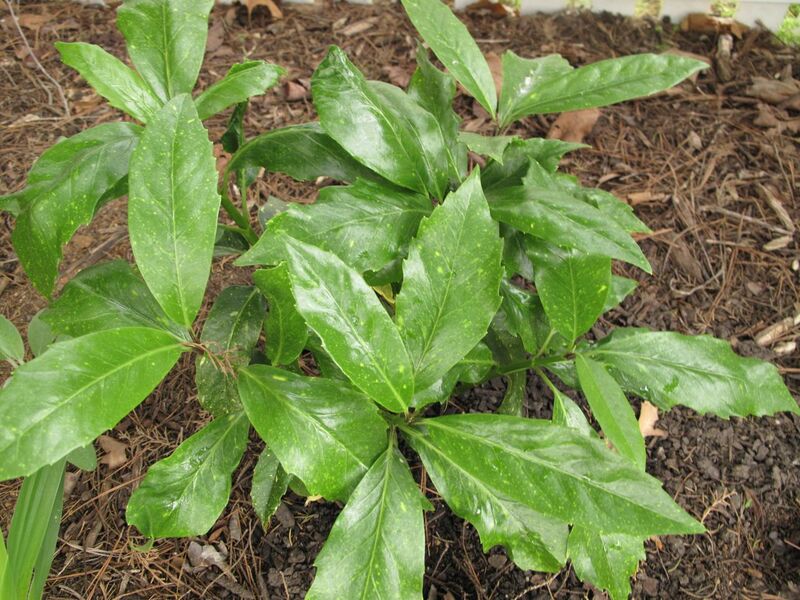 Aucuba japonica ‘Variegata’ (Gold Dust Aucuba) was added in spring and has adapted well. 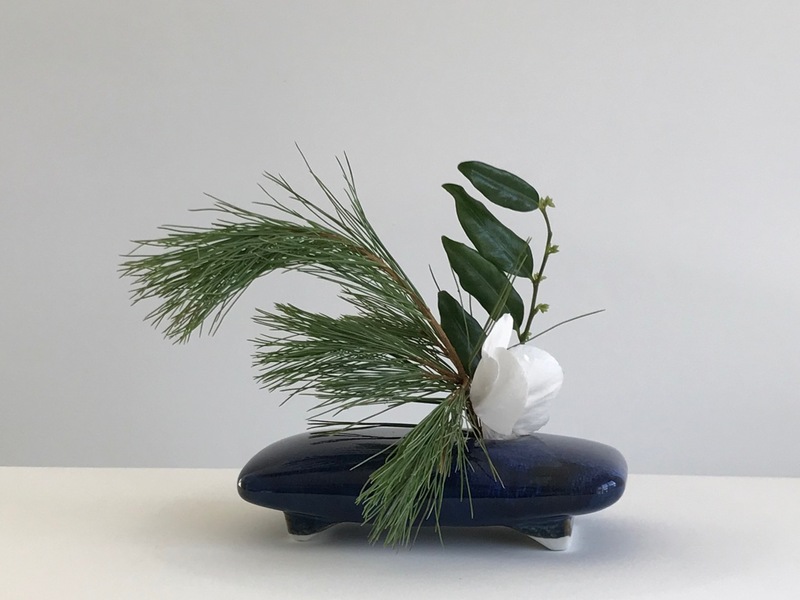 It may soon get too large for its location but I purchased it because its foliage is nice for flower arrangements, not actually because I had the appropriate space. Moving down into the southern border Daylilies and Artemisia ‘Powis Castle’ make a nice paring. Rudbeckia fulgida (Orange Coneflower) nestled under the artemisia by its own desire. A spring addition to the garden Camellia x ‘Koto-no-kaori’ shows some yellowing of foliage, but seems to be settling in well along the back fence of the western border. 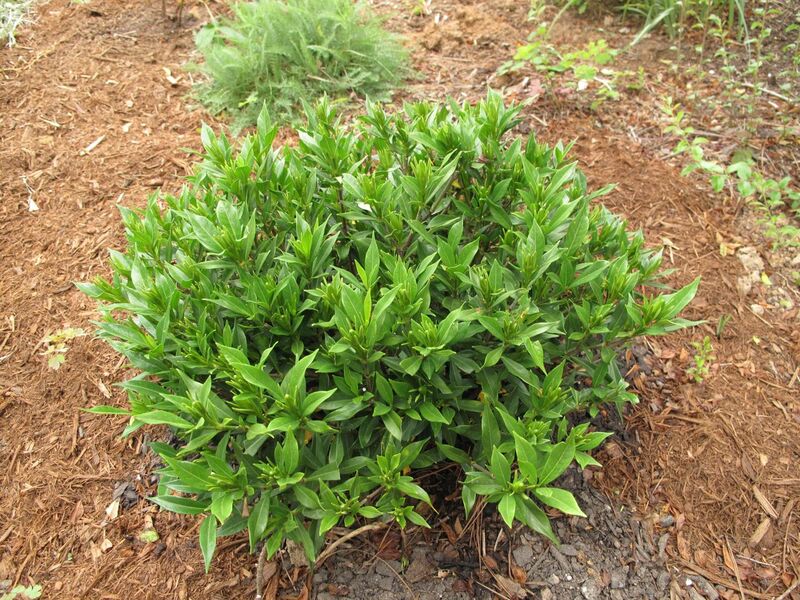 Nearby, Gardenia jasminoides ‘Frost Proof’ looks happy also and seems poised to bloom. 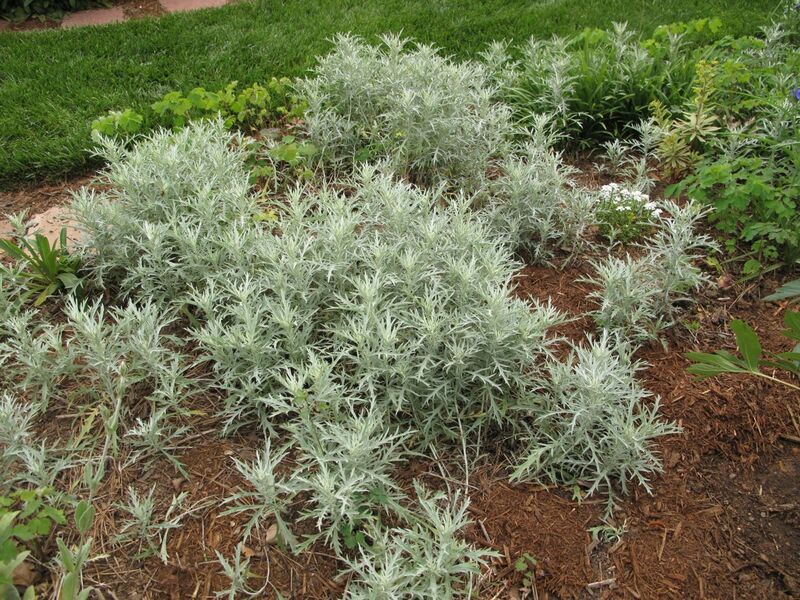 Dusty Miller makes a nice ground cover that spreads itself around easily, but is easy to pull out. 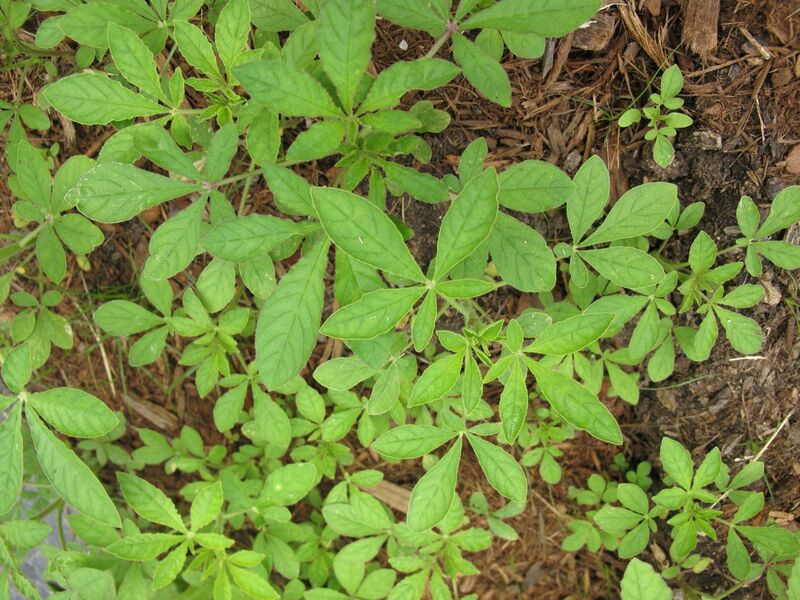 Maybe hundreds of Cleome hassleriana (Spider Flower) volunteers are vying for a spot in the garden. 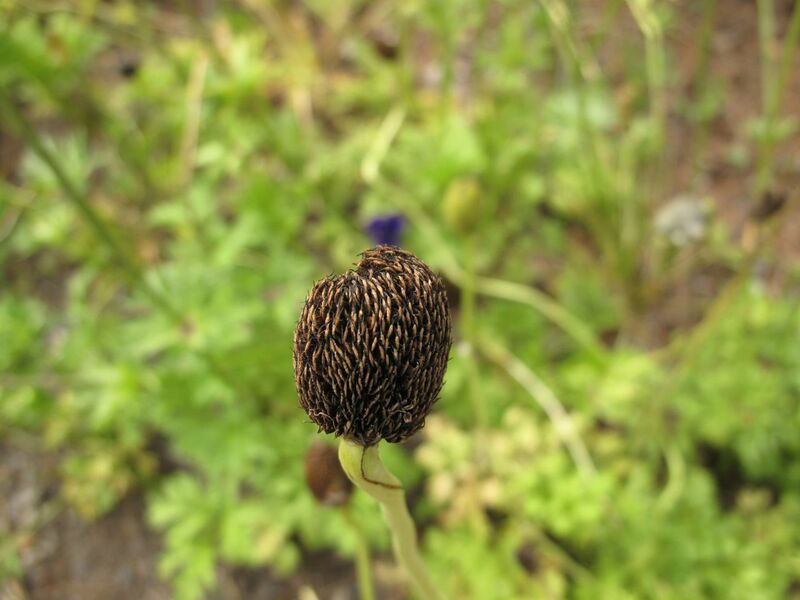 Anemone coronaria provided a huge boost of color in early spring. I have not quite known what to do with them now so have just been letting them die back. 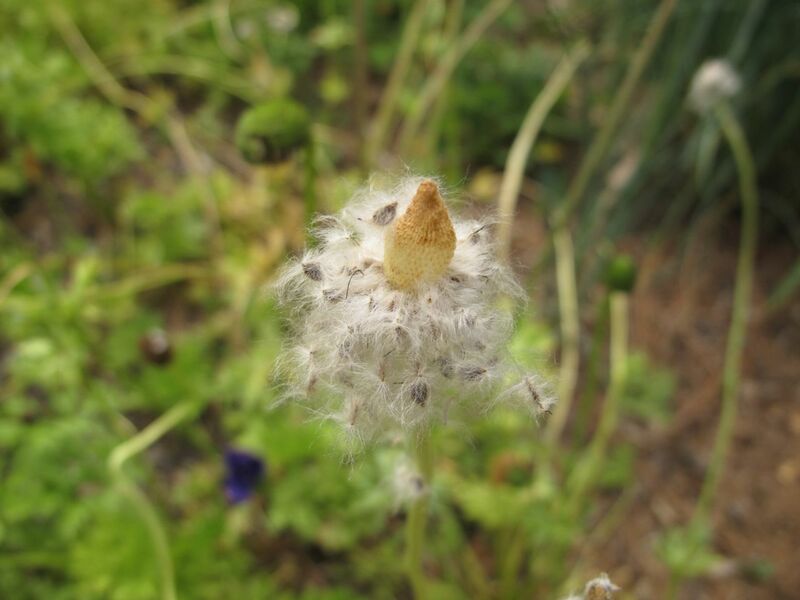 One of two flowers still pop up, but mostly the seed heads are are providing the interest. Two large specimens of Rudbeckia hirta ‘Irish Eyes’ are zipping upward and outward. This one is against the fence in the western border. Another one fills a corner at the southern side path entrance. Visit Christina at Garden of the Hesperides for a look around her Italian garden and find links to foliage perspectives from many parts of the world. 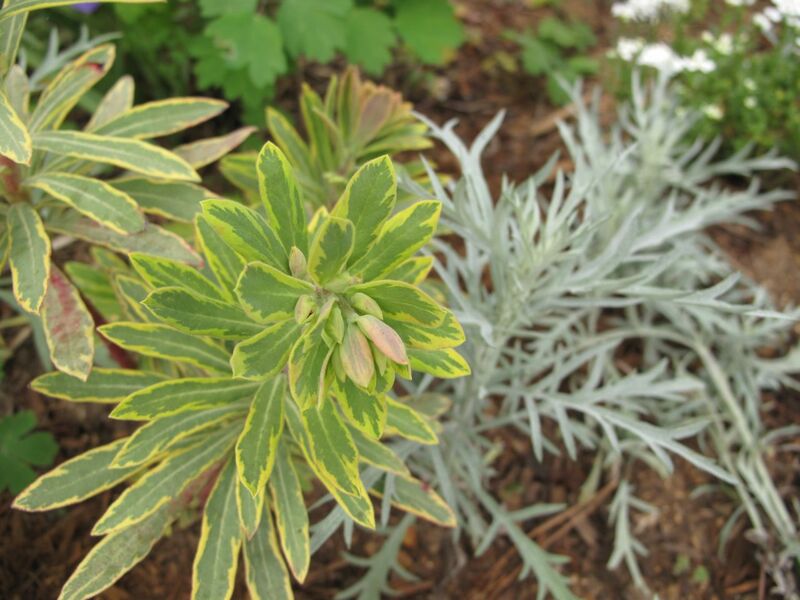 This entry was posted in garden and tagged Accuba japonica 'Variegata', artemisia, dusty miller, Garden Bloggers Foliage Day, Gardenia jasminoides 'Frost Proof' (Gardenia 'Frost Proof'), GBFD, Liatris spicata 'Floristan Weiss', Rudbeckia hirta 'Irish Eyes', sarcococca rustifolia on May 22, 2015 by pbmgarden. 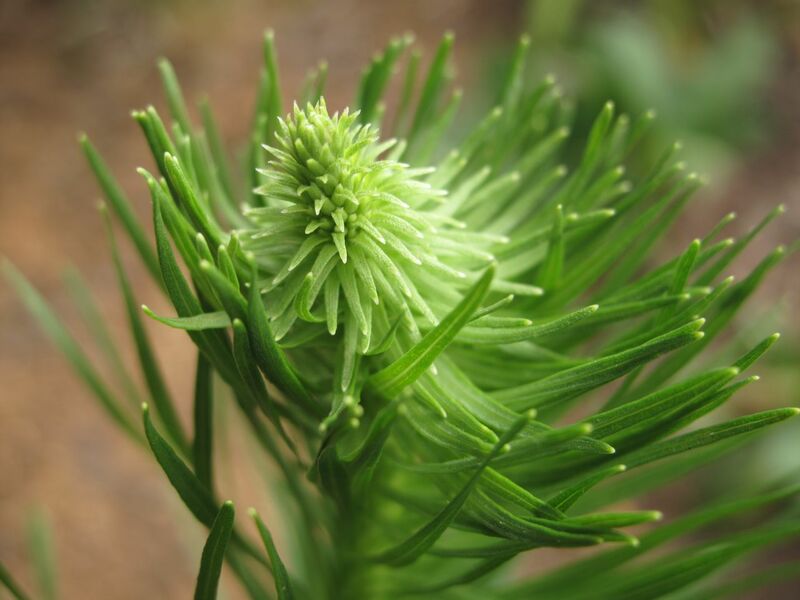 The first day of autumn coincides with Garden Bloggers Foliage Day (GBFD). The countryside and the garden remain fairly green—very little autumnal leaf color so far. 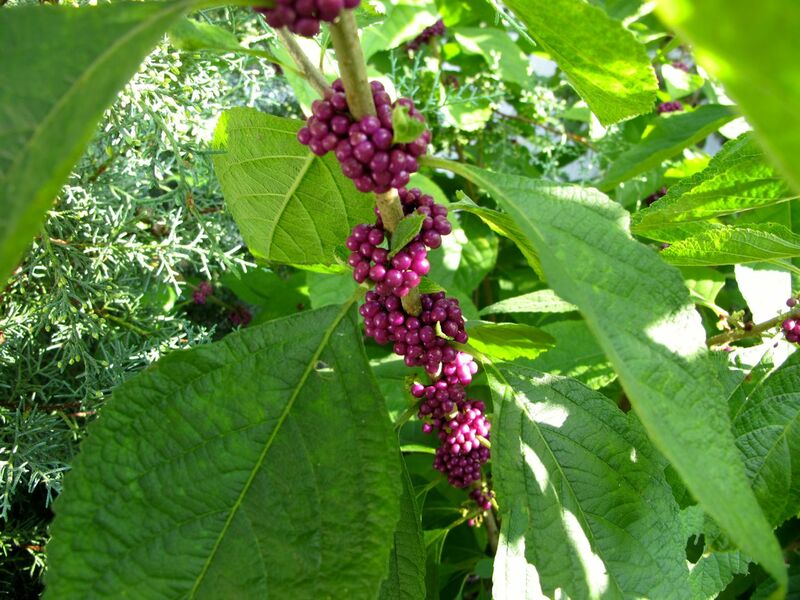 As one sign of the season, stems of the native Callicarpa americana (American beautyberry) are covered in purply ripened berries. In the Northern Hemisphere the fall season arrives today with the occurrence of the autumnal equinox, September 22 at 10:29 p.m. EDT. It was almost 90°F yesterday, but now at 5:00 p.m. it is a pleasant 71°F. The rest of the week should remain in the seventies during the day, dropping into the 50s at night. There was a surprise shower overnight, not enough to fill the bird baths but any amount is needed and welcome. 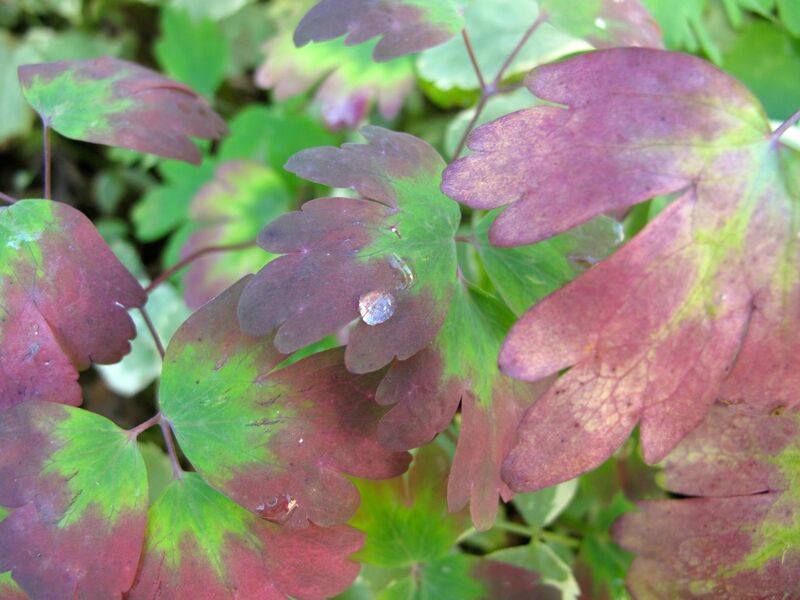 A few drops remained on this Aquilegia canadensis (Eastern red columbine), decorated with bits of red as it transitions toward fall. 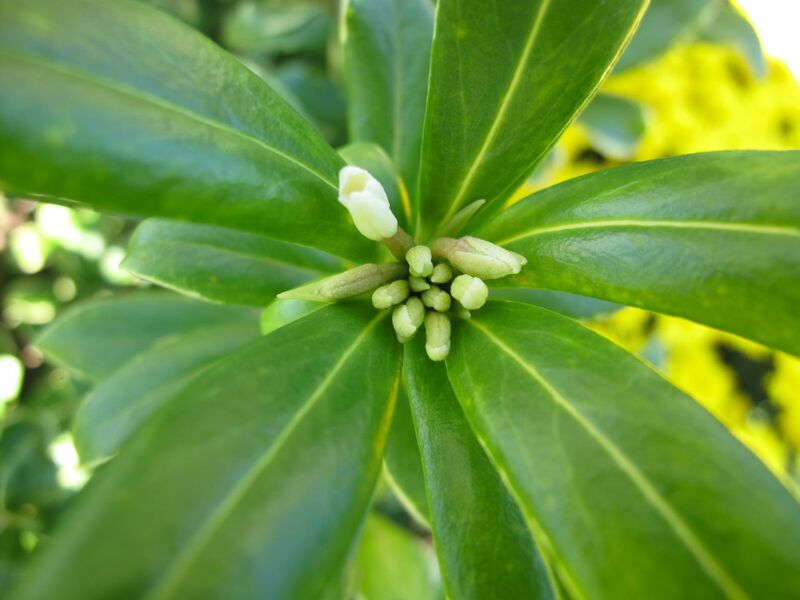 Strange as it seems, last week I could detect the fragrance of Winter Daphne. Three of these lovely shrubs serve as hedge at the front of our house. Along the northern side yard camellias, gardenias and hellebores add green interest. 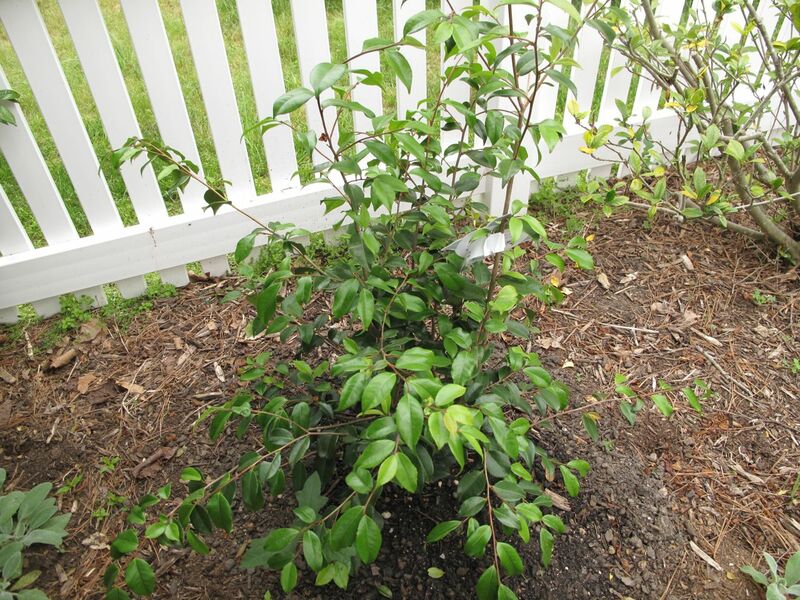 The camellias are gaining fat buds that will open in another month to six weeks. 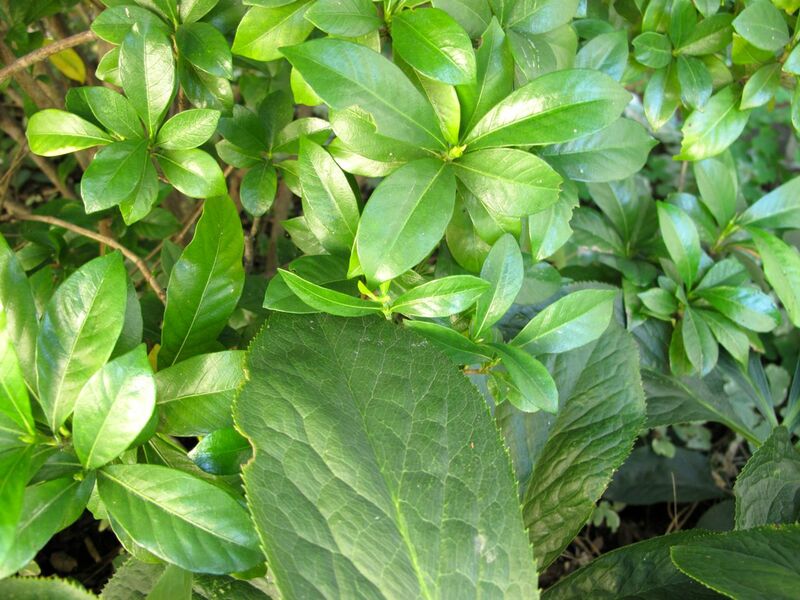 The gardenias in this position look healthy, more so than others in the back garden. 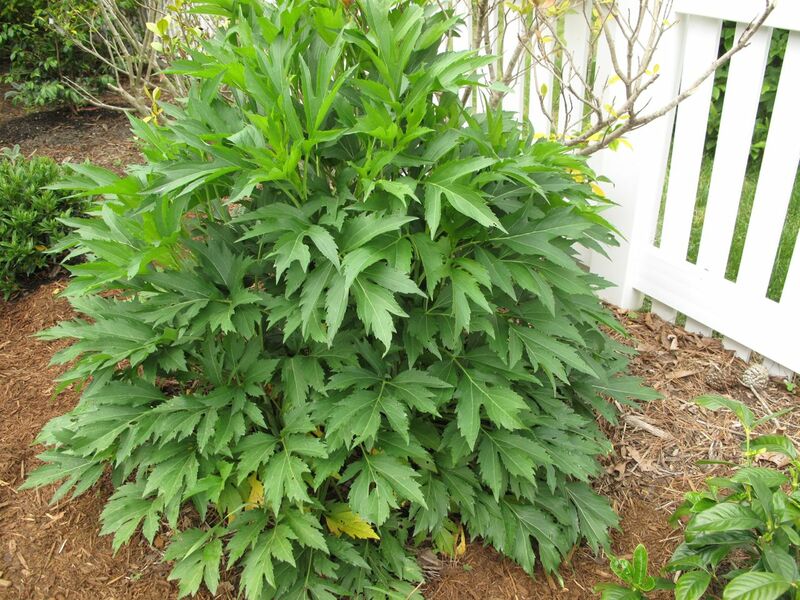 Stationed nearby Hellebores are full of strong, deep green leaves. 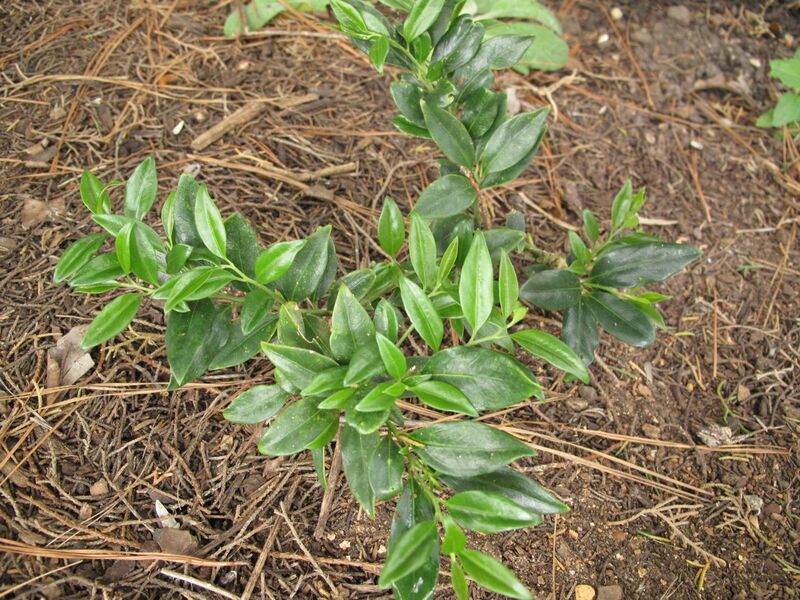 For several years I have been monitoring the progress of a small passalong Sarcococca ruscifolia (Fragrant Sweet Box). It requires full shade which is hard to find in my garden. I planted it underneath one of the corner ‘Carolina Sapphire’ Arizona Cypress specimens, where it receives scant early morning sunlight. 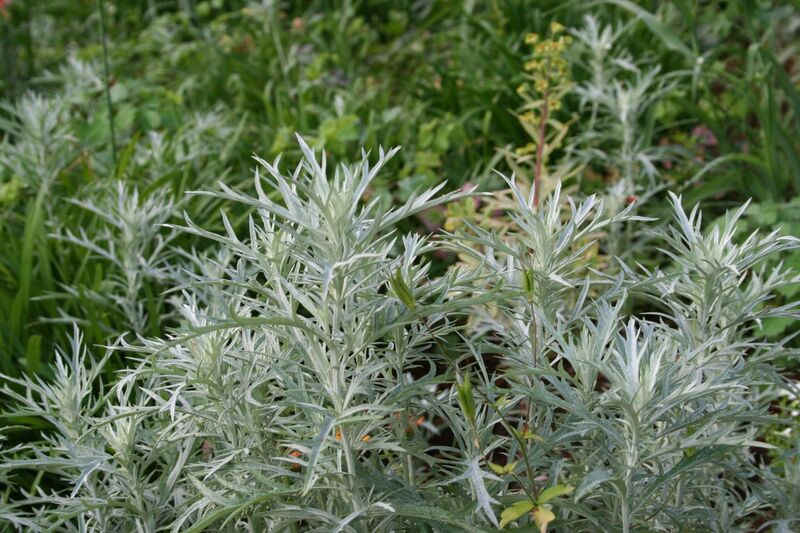 The plant remains very small but the foliage look great this year. 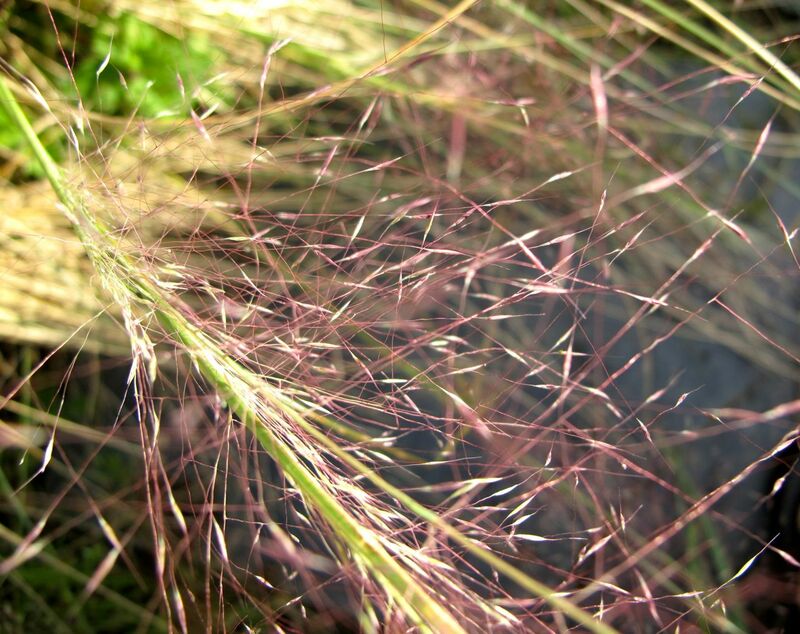 The only featured grass in my garden is Muhlenbergia capillaris (Pink Muhly Grass). Despite it not being very well situated, this year it looks very nice. A big thank you to Christina at Creating my own garden of the Hesperides for hosting GBFD on the 22nd of each month. This entry was posted in garden and tagged almanac, Aquilegia canadensis (Eastern red columbine), Callicarpa americana (American beautyberry), Daphne odora, foliage, Garden Bloggers Foliage Day, gardenia jasminoides, GBFD, helleborus, Muhlenbergia capillaris (Pink Muhly Grass), nature photography, sarcococca rustifolia on September 22, 2014 by pbmgarden.